HTC is also launching new phones its Desire series to target China's mid-range phone market. 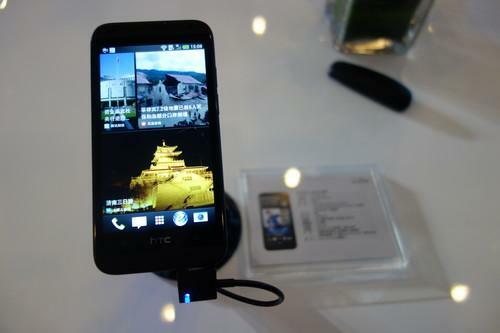 Its fortunes in the West having stumbled, HTC is looking to the massive China smartphone market to keep it in business. The shift was evident Tuesday when HTC picked Beijing to unveil the HTC One Max, in a departure from major launch events in the past, which were held in the U.S. and Europe. "This market is so important," Jack Tong, HTC's China president, said on the sidelines of the event. China is "the biggest market in the world," he said. "We are making China our home market." Based on the island of Taiwan, HTC is right next to the Chinese mainland. But long before China emerged as the world's biggest smartphone market, HTC had decided to focus its efforts on the U.S. The strategy paid off at first, and HTC's Android handsets led the U.S. market as recently as 2011, with about 20 percent of devices sold. But HTC's business started to decline the next year, pushed out by more popular devices from Apple and Samsung, and HTC now has just 9 percent of the U.S. market. The poor sales have strained its finances, and earlier this month it reported its first net loss in a decade. The outlook appears bleak for the Taiwanese firm: Nokia and Motorola ran into financial trouble and ended up being bought out, and BlackBerry too is seeking a buyer. There has been speculation and rumors that HTC could face the same fate. But on Tuesday, HTC put on an optimistic face to unveil its new handset, a 5.9-inch phablet called the HTC One Max. The device comes with a fingerprint scanner, like Apple's iPhone 5s. But another key selling point for HTC is the device's support for China's upcoming 4G LTE networks, which could be switched on as soon as the end of this year. "This is the first LTE-enabled big-screen phone for the country," Tong said. "We hope to offer high-end phones that can complement the coming era of 4G." In targeting China, HTC is aiming for a market that could see 240 million smartphones being sold this year, almost twice as many as in the U.S., according to research firm Canalys. The growth has been so robust that since last year's second quarter, China became HTC's largest market for smartphones, but still not enough to turn its fortunes around. HTC has said it's becoming recognized as a high-end brand in China, but its market share is still so small it doesn't make the top 10 rankings for vendors there, according to Nicole Peng, an analyst with the research firm Canalys. Standing in its way is a small army of entrenched rivals, many of them local. Samsung and Apple are the only foreign vendors to have established a significant share of the market, with the rest dominated by Lenovo, Huawei and smaller domestic companies. Complicating matters is that demand in the country is being driven by low-end Android phones, some sold for 1000 yuan (US$163) or cheaper. Historically, HTC has gone in the opposite direction and sold high-priced phones. Its other flagship handset, the HTC One, starts at 4488 yuan without subsidies. HTC has offered some phones for price-conscious buyers since it entered the Chinese market in 2010, and on Tuesday it did so again. Alongside the One Max it unveiled several new midrange phones in its Desire series. The handsets range from 1500 yuan to more than 2000 yuan and will launch soon. The lower-end phones recall comments by HTC CEO Peter Chou in July, when he said HTC would introduce new midtier and entry-level phones as a way to regain market share. But selling lower-end handsets can only go so far in supporting a smartphone business. Rivals such as ZTE have conceded that profits in the Chinese market can be hard to generate, when popular low-end phones yield thin margins. As a result, ZTE is trying to boost its profits selling higher-end phones in the U.S. -- the opposite recovery strategy of HTC. But unlike the Taiwanese company, ZTE has a bigger business in networking that can help bankroll its smartphone efforts. The same is true for Lenovo, a PC vendor, whose smartphone business in China only recently became profitable. HTC's real challenge might be to achieve visibility in a market that has more than 100 smartphone brands. It's relying on China to sell more handsets but the local competition is strong, said Melissa Chau, an analyst with research firm IDC. "It faces a very real risk of being lost amongst all the Android players," she said.